Wachesaw Plantation East, which opened in 1996, is a resort style development built on the site of a former rice plantation in the picturesque Murrells Inlet area of Myrtle Beach. The course designer, golf architect Clyde Johnston, used the natural terrain to create an alluring taste of Scottish golf design with traditional mounding and rolling fairways that lead to the fast and true Tif-Eagle greens. Freshwater lakes and scenic wetlands provide a tranquil background while strategically-placed bunkers awaken you to the course's challenge. 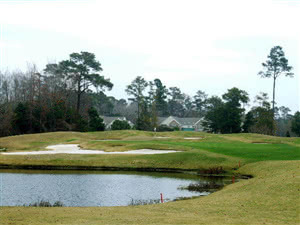 The use of five separate tee areas mean that golfers of all skill levels can enjoy playing Wachesaw Plantation East. However, the course has also hosted four nationally-televised, professional golf tournaments on the LPGA tour. Many of the world's best golfers, including Annika Sorenstam, Karrie Webb and Laura Davies have played here.